Professor Shoji Shibata, an honorary member of the Japanese Society of Pharmacognosy, passed away on July 12, 2016, at the age of 100. 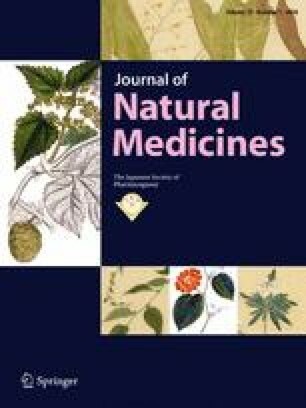 To the deepest regret of all members of the Japanese Society of Pharmacognosy, I sincerely express our condolences here as a preface to this memorial issue of the Journal of Natural Medicines. Professor Shibata was born in Tokyo on October 23, 1915. He received his bachelor’s degree in 1938 from The University of Tokyo and became an assistant professor there in 1942, an associate professor in 1944, and full professor of pharmacognosy in 1950. He retired from The University of Tokyo and became a professor at the Meiji Pharmaceutical University in 1976. Professor Shibata carried out an extensive range of research on lichens and fungi metabolites, structural activity relationships between natural components and biological activities, and active components of carrots, licorice, peonies, and other traditional medicines. He also pioneered research on the biosynthesis of secondary metabolites, ahead of others in his field worldwide. On the basis of his great contributions, Professor Shibata received numerous honors and awards as a pioneer in modern pharmacognosy. He was given the Pharmaceutical Society of Japan Award in 1959, the Japan Academy Award for “Studies on the Metabolites of Some Fungi and Lichens” in 1973, and The Order of the Rising Sun, Gold and Silver Star in 1987. Professor Shibata was honored as a Person of Cultural Merit in 1997 and was a member of the Japan Academy from 1993 to 2016. He played a key role in the establishment of the Japanese Society of Pharmacognosy in 1947 and was an honorary member of the Society since 1984. Professor Shibata’s great contribution to the development of the Japanese Society of Pharmacognosy and the leading role he played in research and education in natural medicines for many long years are truly remarkable. I pray for the repose of his soul, and sincerely thankful for his many great achievements.